I was super fortunate to be able to get my hands on some Vice Liquid Lipstick the day they released online. I tried two matte shades and 2 metals shades. I will just dive right in. The packaging is what you would expect from Urban Decay. It matches their newer Vice Liquid Lipstick line, and it looks luxurious and feels sturdy in your hands. There is a decent variety including neutrals, pinks, reds and purple shades along with a few nudes. They have a few "metallic" shades which is basically chunky glitter in the matte lip world. Not my favorite look personally but some love it. They smell good. The smell isn't like to-die for or unique or super yummy, but it is pleasant and it isn't very strong which I prefer. The wear got a four because it does stay all day and it didn't dry my lips out any more than other liquid lipsticks do. However it is kind of sticky, which I didn't like. Kissability is a 4 because I could kiss my husband with it on and there was hardly any trace on his cheek. There was a little bit that would transfer, but very little. In the end there are other brands that I prefer, that are 5 star! But as for something I can try on and pick up in store this is a good value and it works. 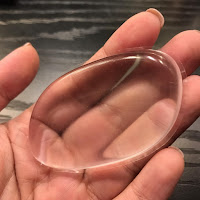 So I am finally ready to write my review on the Silisponge, this was a tough one for me guys. I had a GREAT first experience with it, and then after I just couldn't replicate that same experience. I wanted to give you a really accurate review and not just a "I used it once and it looks nice" thing. I tried it with high end and low end foundations, I tried it with different layers of coverage. So this is what I found. So here is the deal, the first time I used it I used my Philosophy Miracle Worker Foundation. I was at the every end of my bottle and was basically wiping the pump on the silisponge to get off every last drop that I had left. It worked awesome! I covered my whole face with maybe one pumps worth of this foundation (I usually use two), and it didn't settle into fine lines and wrinkles. I was super impressed. So the next day I used it again but with my Mary Kay CC Cream, and I put one full pump onto the sponge. I dabbed onto different areas of my face and began to blend it in. I felt like it was streaky and just awful. I was not a fan. I ended up using my Beauty Blender to finish blending. HOWEVER - even though I had to use my beauty blender to finish blending it in, I still only used one pump instead of the normal two! At this point Tuesday had rolled around and I was not ready to review it. I had had one good and one disappointing experience. I spent the rest of the week trying different foundations (including the Urban Decay All-Nighter Foundation, Estee Lauder Double Wear, Maybelline Fit Me liquid, Loreal Infallible Pro, and the Exuviance Cover Blend as well as the aforementioned Mary Kay and Philosophy foudnations). SO I am going to go over some of the things I loved, and didn't like about this sponge. After each thing I will put which of the above five factors this particular issue was a part of. I am keeping it! You guys are probably shocked right? I am too, but after using it so much, when I didn't one morning I was annoyed with how much product I had to use. I knew that foundation was being swallowed up by my beauty blender only to be washed down the drain, and when you spend $40+ on foundation you want it to last. While it adds an extra step if I am not focused on really blending my product in with it, then it doesn't take to long. I apply my foundation to the silisponge, I pop drops of it to various areas on my face. I basically wipe it around to distribute it using the silisponge, and then I wait like a minute with it all unblended there. Then I use my beauty blender to tap it in really quicky, and we are done! Those patches where I couldn't seem to get the silisponge to fit, I use the excess to get in there with my beauty blender. I have used less foundation and still got a great finish. That extra two minutes is worth it to me. If you think about an Urban Decay foundation ($40) if I only use half as much that means I am saving so much money! I go through one bottle of foundation every 6 weeks with Urban Decay, so that means now it will be every 12, which saves me over $170 a year! I have also been loving it for my moisturizer too! I am cheapskate and this is a money saving product! That is why the Extending Longevity of Foundation got a 6, which pulled it's overall rating up to a 4 out of 5! Because that fact alone means it is staying in my drawer. I have never reviewed toothpaste before. This is not something I have ever done, I feel like most whitening products are the same. I REALLY wanted to review this though because it is different. Most whitening products use fluoride and peroxides to white the teeth. These can damage the enamel of your teeth, and if you don't use them consistently may be pretty ineffective. I have rarely stuck to whitening products because I hate the taste of fluoride and they all have it. So enter Color Wheel Toothpaste. This was created by a hairstylist. We have all heard of purple shampoo right? When a blonde's hair starts to yellow they can use purple shampoo, the purple toner in the shampoo counteracts the yellow in their hair and creates white! Well this hairstylist thought, why can't I do that with toothpaste, and her million dollar idea was born! I have no idea if she has made a million dollars yet, but this is a game changer! So why not just throw some food coloring into your toothpaste? 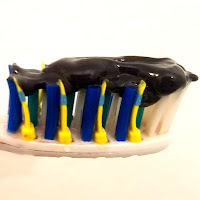 I am sure that is something we will see on pinterest in 5 years when Crest comes out with their own cheaper version (that will not be as good I am sure). But I can assure you the color wheel isn't as simple as one drop of red + one drop of blue = the perfect shade of purple to counteract the yellowing of teeth. 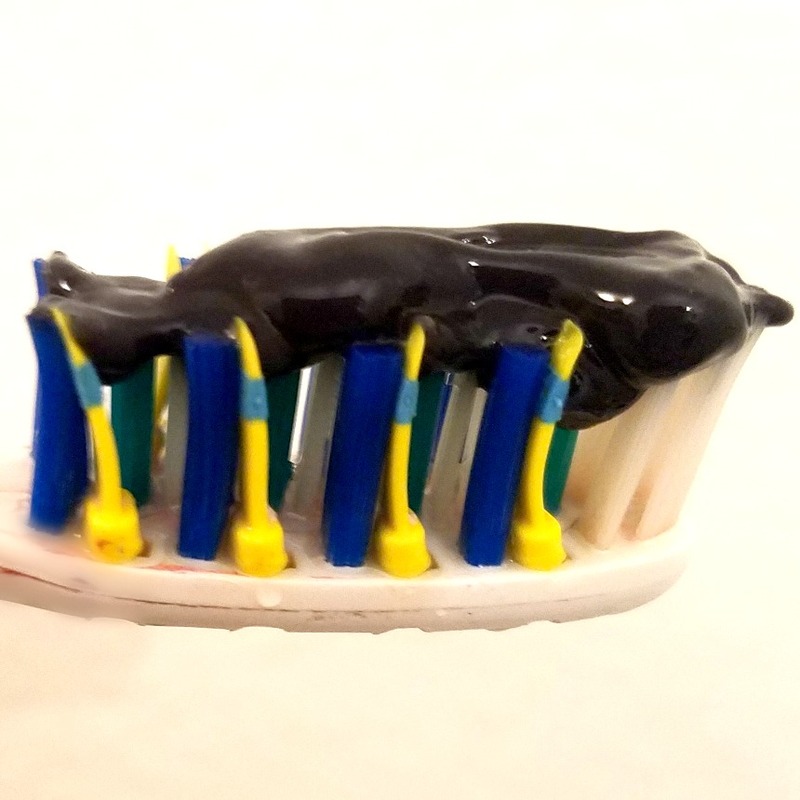 They put a lot of research and work into developing this product, and if you try the food coloring you will most likely end up with purple or grey tinted teeth. I have struggled with yellow teeth forever! My parents didn't really care about oral hygiene when I was a kid and I never brushed my teeth. As an adult I have delt with my yellow teeth forever! So I bought some to try and you guys, it's amazing! It work INSTANTLY. I have now used it three days and I am a life long customer I can assure you. What is different about it other than the technology? It is fluoride free (hurray!) and all natural. It can be used in place of your normal toothpaste, or you can use it before a wedding or other special occasion! I have used it as a normal toothpaste once, and the other two days I used my regular toothpaste (aquafresh for the win) and the just used my finger to rub a little of this on the front (where you see when I smile) let is sit for 3 minutes and rinsed. Both worked very well, I like the second option only because it is a pricey product and I used less of it this way. It tasted super minty, it has peppermint and tea tree oil in it which made it taste like spearmint gum. I have also found other sensitive or whitening toothpastes make my mouth feel dry or it just doesn't feel clean in general, this definitely did not have that issue. I recommend it! Now for what I know you REALLY want to see, a before and after. Well the front facing camera on my phone is absolute crap, so here is my husband's results. I wish I had had the forethought to have him do the pictures of me, I honestly didn't think it would work though. But here are his before and afters!